What's Going on Today: Hallelujah - it's warm enough for the playground! Naptime Goals: Bread Pork to make for tonight's dinner, chop vegetables for salad. Parenting Lesson of the Day: Children + Fresh Air = Long naptime. It is hard to find a place to begin cooking when working from Tessa's book Falling Cloudberries. In this volume Tessa takes us on mouthwatering culinary journeys through Finland, Cyprus, Greece, Italy and South Africa, all countries she has lived in during her lifetime. Each chapter includes memories, the family members who lived there and visual reminders of her experiences. Frankly, the poetry and photography within these pages are enough to make me grab my passport and book a ticket to each local, it is all so beautiful and unique. The recipes within each chapter are amazing as well, each reflecting their country of origin in flavor and ingredients. To make things easier on myself I decided to start at the beginning, with the Finland chapter. In a way this is quite fitting since my friend's who live there just had a baby (welcome Charlotte!) and since my husband just told me he was in the mood for pork. In a weird way these two, completely unrelated, events signaled to me that it was perfect time for Tessa's Pork Schnitzel. The beauty of this recipe is that I can pound and bread the meat while my daughter naps. Then I place it, covered, in a fridge until it's time to cook later on. I also like the fact that pounding the meat is done during naptime. Letting loose on the meat is fun and is a great way to vent frustration so, needless to say, it is best done when children are not around. Finishing the dish in the evening takes mere minutes and, best of all, it something even my toddler enjoys. I cut one of the pork pieces into strips and served it to her while we ate ours whole. There were some leftovers from this recipe and, per Tessa's suggestion, I made a sandwich with it the following day. It was a delicious way to enjoy a great meal for the second time. I also think it would have been good if I'd chopped it up and tossed it with a salad. Either way, it is the dish that keeps on giving in more ways than one. Now that I've completed the first recipe in the Finland chapter I think I'll turn the page to Cyprus and see what's next! 1. Place the pork slices between two pieces of wax paper or plastic wrap. Using a meat pounder or heavy rolling pin, beat pork until it is 1/2 inch thick. 2. In a large bowl, whisk the eggs until all of the yolks are broken up. Then, add the garlic, rosemary, paprika, salt and pepper. Then, place the breadcrumbs on a flat plate next to the egg mixture. 3. Dip a pork slices in the egg mixture and make sure it is thoroughly coated, then transfer to breadcrumbs and turn over to coat the entire slice of pork. Then, place it in a baking dish if storing in the fridge for the afternoon. Repeat with remaining pork. 4. In a medium saucepan heat the olive oil until just before smoking and add the pork cutlets. Saute until they are nicely golden brown and cooked through. 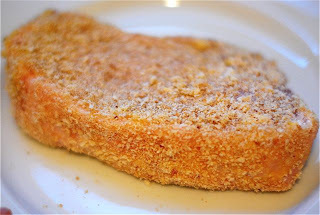 Naptime Recipe Variations and Ideas: For a twist on flavor the pork would be delicious if you added Parmesan cheese and some different fresh chopped herbs like thyme or basil to the breading. Or, simple leave it totally plain and finish it out with a lemon butter sauce. Naptime Stopwatch: 20 minutes to bread the meat, 10 minutes for cooking in the evening. 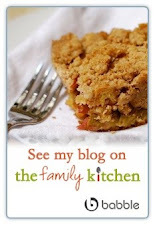 Naptime Reviews: This is a great recipe for adults and kids. If your kids like things in "strip" form like mine does these days then simply cut up the cutlet and serve with dipping sauce. I also love Tessa's cookbooks. Thanks for sharing this recipe, especially since it makes a tasty 'wich the next day too! How neat of you to have included us in this entry! This looks like such a great cookbook. I'm so curious to see the Finnish section so I must order. Kittos (thank you) for this post!